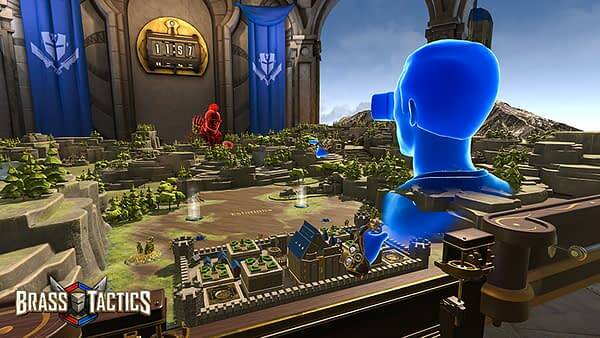 Back at PAX West, myself and Madeline Ricchiuto both had a chance to check out Brass Tactics at the Razer booth and at a special Oculus Rift party. In fact, I got some awesome photos of Madeline stabbing at the air as she decimated her AI opponent. Today, developer Hidden Path Entertainment (Age of Empires II) formally announced that the game would be coming out on February 22nd. You can pre-order the game right now for $40, but there is an option on the Oculus store for only $25 if you decide to spend your money on them instead. Below is the formal announcement trailer for the game, which if you haven’t checked it out yet, is a tabletop RTS game that was built and designed exclusively for the Oculus and tries to utilize the technology to it’s fullest potential. I can say from playing a bit of it myself, you tend to feel like a Greek god as you reach into a drawer under the table for all of your living units and place them about the battlefield in an attempt to conquer everything in your path. Or at the very least, lay waste to everything your opponent throws out. It should be awesome when the game is released next month.